Stamps: Autumn Leaves "Borders Love Each Day"
Ink: Dew Drop Brilliance "Cosmic Copper", Inkadinkado "Terra Cotta", Memento "Rich Cocoa"
Embellishments: Stickles "Platinum", Recollections Adhesive Faux Pearls, Prima Flowers, ribbon and buttons from my stash. Embellishments: Recollections Adhesive Faux Pearls, Martha Stewart Butterfly Stickers, ribbon from my stash. As I mentioned in my previous post, I've been enamored with the color pink of late. I can't get enough of it! So I figured I'd give in to the urge to make another pink paper craft, and came up with this adorable card. All right, so it's not entirely all pink. There are some blues in there, some greens, and even a few yellow hues. As I was making it I thought it would work well as a baby card, but since I don't have any need for a baby card right now, I used a more versatile sentiment. 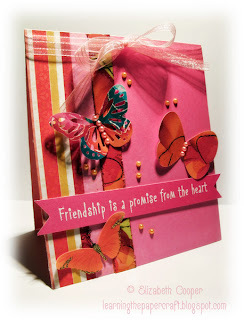 Stamps: Hampton Art "Carpe Diem"
Ink: "Festive Berries" Distress Ink, Memento "Bamboo Leaves"
Embellishments: Recollections Adhesive Faux Pearls, Forever in Time Floral Embellishments, Recollections Butterfly Brads, ribbon from my stash. I've been drawn to the color pink lately. I know Valentine's Day is over, but I'm not done with frothy, girly color hues. Despite that, this card ended up quite a bit more Christmas-y than I was expecting. I think that's due to the green hue and the way the stripes are placed in the pattern paper. 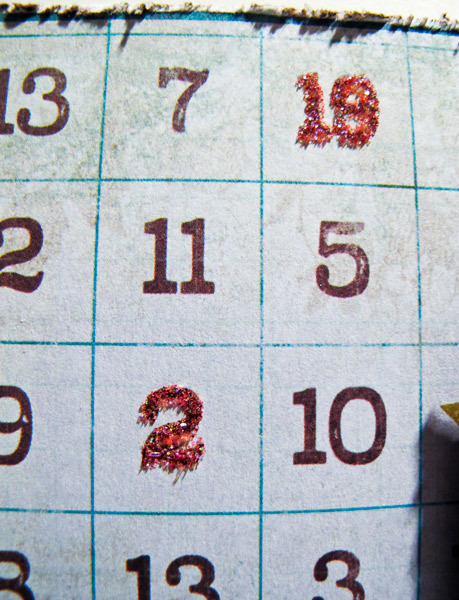 I really like the twine made to look like it's just floating out there on the card. I assure you, it's quite securely laid in place with some Tombow Mono Multi Glue. 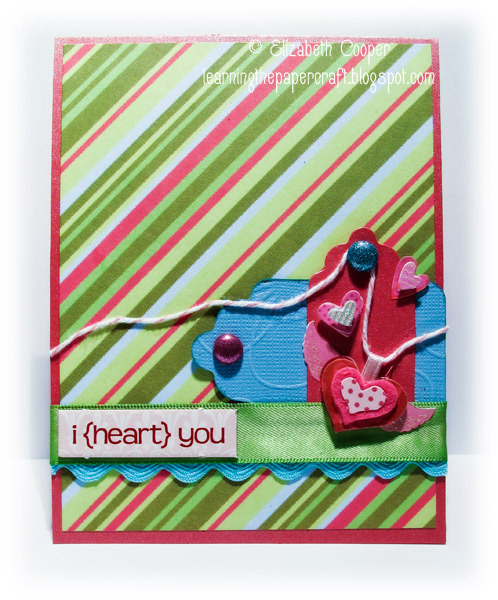 I'm also crazy about the scalloped blue ribbon, and the way the sentiment fits just perfectly on top of the green ribbon. Embellishments: K & Company "Sweet Talk Love Birds & Butterfly" Grand Adhesions, Bo Bunny "Sweet Tooth" Brads, ribbon from my stash. 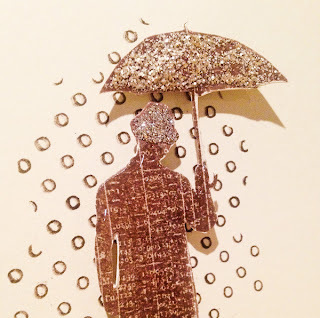 I'm a big fan of Tim Holtz' artistic stamps, and fell in love with the image of the man holding an umbrella as soon as I saw it. 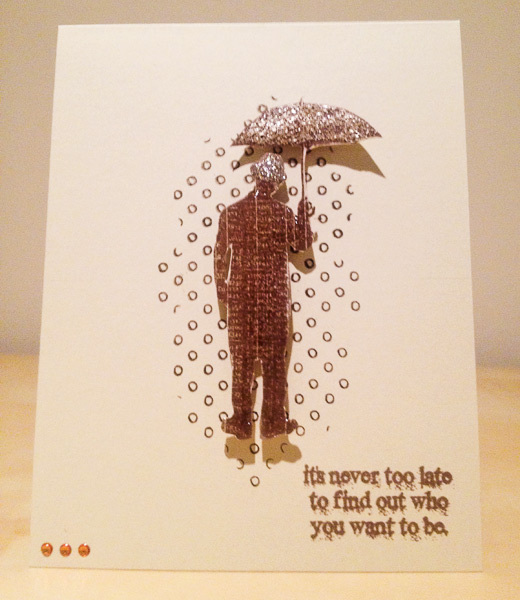 Because it's such a striking image, I thought it needed to be placed on a card that would allow it to shine. 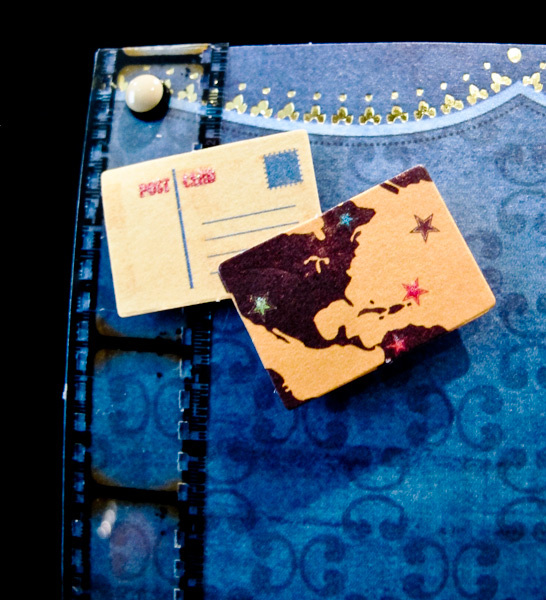 I started by masking the edges of my card. 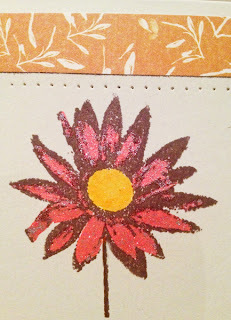 Using a stamp from the Heidi Grace Large Patterns 2 stamp set, I stamped the circles in Walnut Stain Distress Ink. 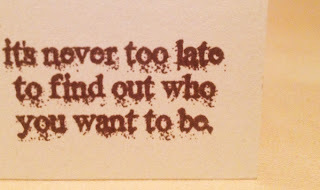 Then I stamped the sentiment in the corner (which comes from the Tim Holtz Purely Random stamp set) using Memento Rich Cocoa ink. I followed that up by stamping the man from the same stamp set, also using Memento Rich Cocoa ink, on a separate piece of cardstock. I fussy-cut him out and adhered him to the front of the card using foam adhesive. Finally, it was time for some bling. 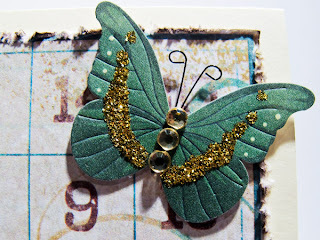 I used the rhinestones from an old pack I had in my stash in the lower left corner. 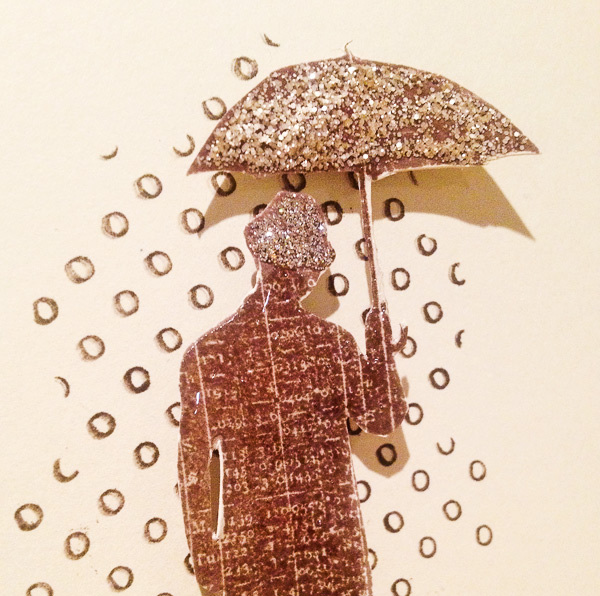 On the man's hat, I used Platinum Stickles, and on the umbrella I used Antique Linen Stickles. Then I went over the entire man with Glossy Accents for some added dimension. 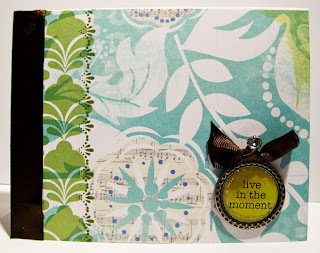 I've mentioned my newfound love of all things from the Unity Stamp Company, right? Their stamps are absolutely fabulous! I started with a piece of pattern paper from the Alla-Prima 6x6 pad. I love the wonderful colors and designs in that pad, and I never know which one to choose! 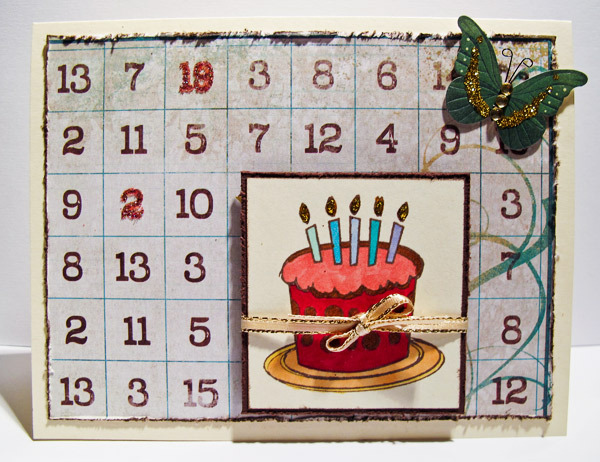 I settled on this one, because the pattern would work with the stamp I'd selected. 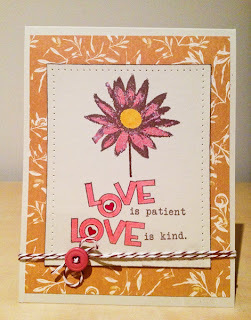 From there, I stamped the flower and the sentiment in Memento Rich Cocoa ink, and then masked both in order to add the flower stem without going over the top of either element. I trimmed the cardstock down to the size I wanted, then went around the edges of the panel and paper-pierced them. 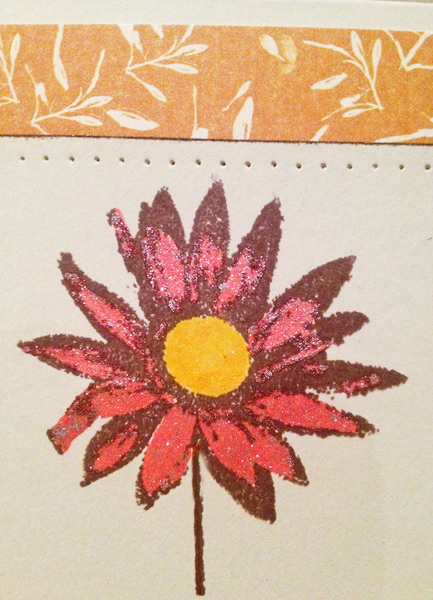 I colored the flower using Copic markers and Glitter Markers from Martha Stewart in Basic Spectrum Colors. 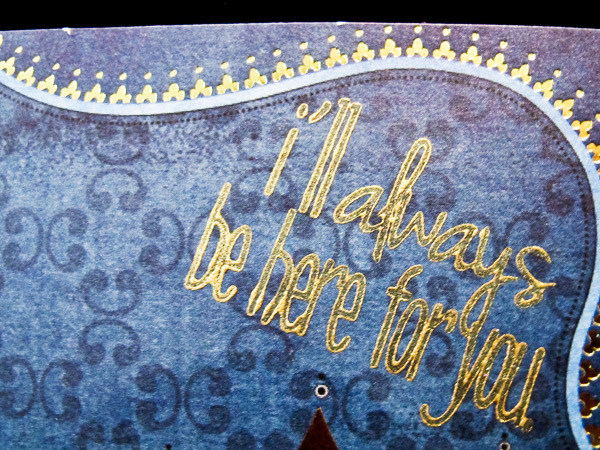 I colored the sentiment with Copic markers as well, and then adhered the panel to the front of the card. Finally, I wrapped some twine from my stash around the bottom of the card, and added a cute button from Jillibean Soup's Christmas collection in a matching color. 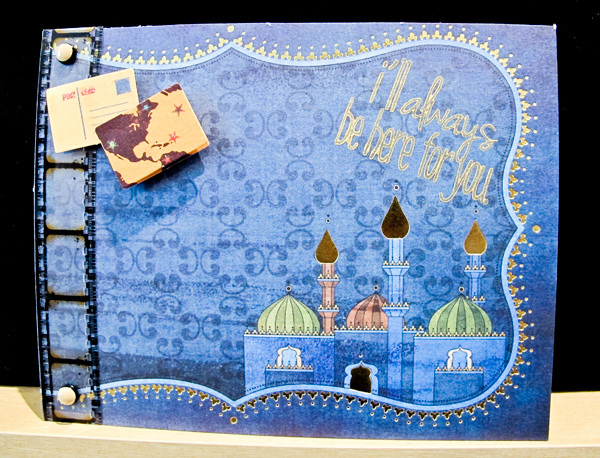 The pattern paper is from a 4x6 paper pad called "Saveurs d'Orient." It's created by Toga, which I believe is a Canadian company. I picked up the paper pad at an art supply store here in town. I cut the paper down to size, and adhered it onto the card front. Then I stamped the sentiment (which is from the Stamps of Life Umbrella4You stamp set) in the upper right corner using Dew Drop Brilliance: Galaxy Gold ink. I absolutely love the way it turned out! The shimmery gold is so lovely against the blue backdrop. I knew I wanted to add some kind of border to the left side. 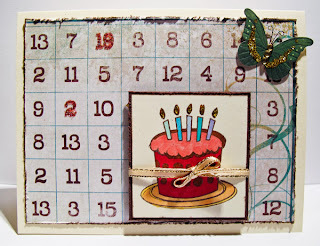 I picked out some Film Strip Ribbon from Tim Holtz, and adhered it to the card using two Bo Bunny Et Cetera brads. Finally, I placed a couple of postcard embellishments from my stash (the packaging's long gone, so I have no idea who makes these), in the upper left portion of the card to tie everything together. I started with a piece of vanilla cardstock, which I cut and folded into the card base. 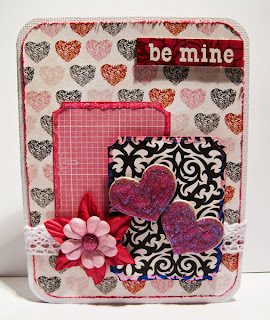 Then I added a piece of pattern paper from the Recollections: Charming 12x12 paper pad. I really like this paper. It's fun without being overwhelming. I distressed the edges and inked them using Inkadinkado Coffee Bean ink. I moved on to the sentiment next. 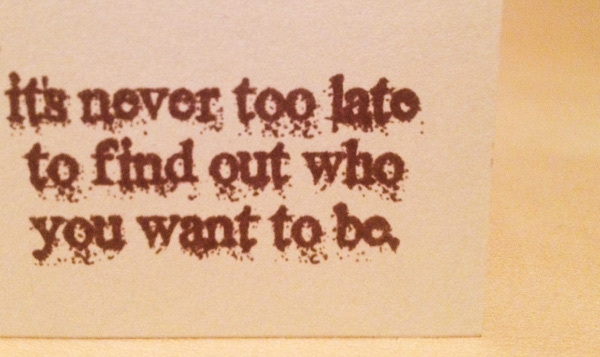 I stamped the image (which comes from the Fiskars Birthday Party stamp set) using Memento Rich Cocoa ink onto a piece of vanilla cardstock, and mounted it onto some brown cardstock to give it a pretty border. I then colored the image with Copic markers and adhered the panel onto the card using foam adhesive. I wanted a few extra touches, so I wound a piece of ribbon around the cake panel to give it a gift feel, and used some Stickles in Golden Rod to create the sparkly flames. I added a cute butterfly from Martha Stewart's Butterfly Stickers pack to one side of the card. I really liked that the glitter on the butterfly matched the Stickles I used on the flames of the cake. 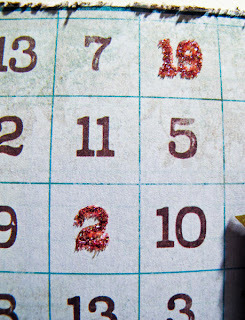 And because my mother's birthday is in February 19, I used a fine-tipped glue pen to go over the "2" and the "19" in the background paper, and then added some Martha Stewart glitter to those numbers to make them stand out. Finally, I stamped the sentiment, also from the Fiskars Birthday Party stamp set, on the inside. 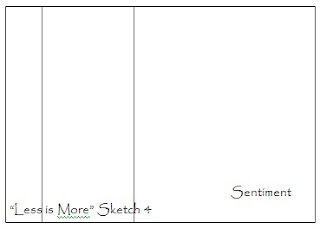 I started with a piece of pattern paper from Me & My Big Ideas: Specialty Cardstock 12x12 pad. I really liked this particular pattern because it had a vertical strip built in on the left with that bright green design. Then I added a piece of brown silk ribbon from my stash, and adhered it to the left side of the card to create the other vertical strip in the sketch. 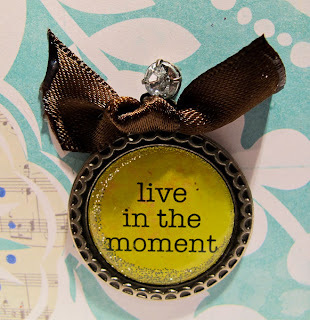 For my sentiment, I used one of my favorite embellishments ever, a beautiful charm from The Girls' Paperie: Glitter Charm Quotes pack. I adhered it to the card using glue dots, and then I wrapped another piece of that same ribbon around the top and tied it into a knot. And just that easy, the card was done! Valentine's Day... It's almost that time of the year again! Hubby and I always go out for a nice dinner, but we don't exchange gifts. I do, however, always give him a card. 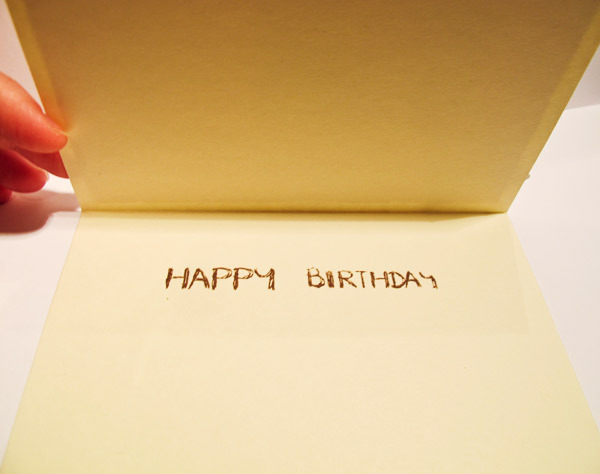 And this year, this is the card he's getting. 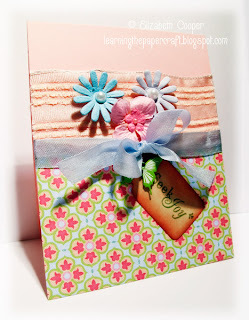 I'm also entering this card into this week's Color Throwdown challenge. Their color palette was the inspiration for the card. I started with a piece of pattern paper from the Echo Park: Yours Truly 6x6 paper pad. 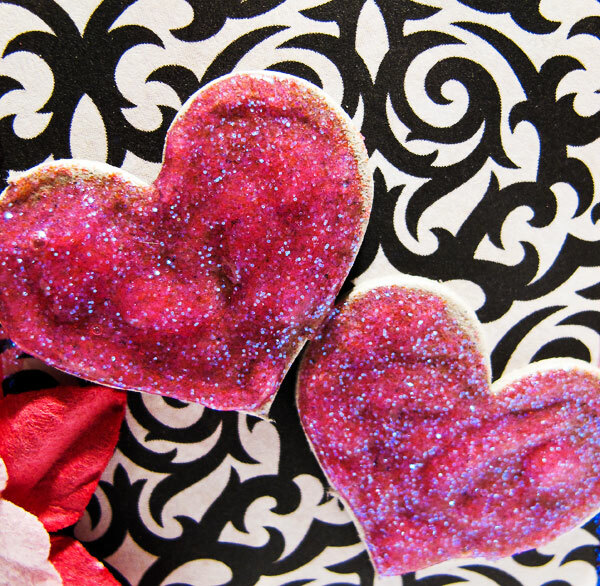 How cute are those hearts?! I distressed the edges and then inked them in Memento Ink: Rose Bud, before adhering the paper straight down to the cardstock. I chose a piece of lace ribbon from my stash and wrapped it around the bottom of the card. Then I took another pattern paper from that same pad, and die cut two pieces using the Spellbinders Nestabilities: Small Labels die. I used both sides of the paper, inked the edges with more Memento Ink, then glued the pink side directly down to the card front, and adhered the black-and-white side down using foam adhesive. The hearts came next. They're from the Scenic Route: Chipboard Hearts set. I adhered them using glue dots. I created the flower using some Prima flowers and a brad from the Bo Bunny: Sweet Tooth Brads package, and adhered it with a glue dot as well. 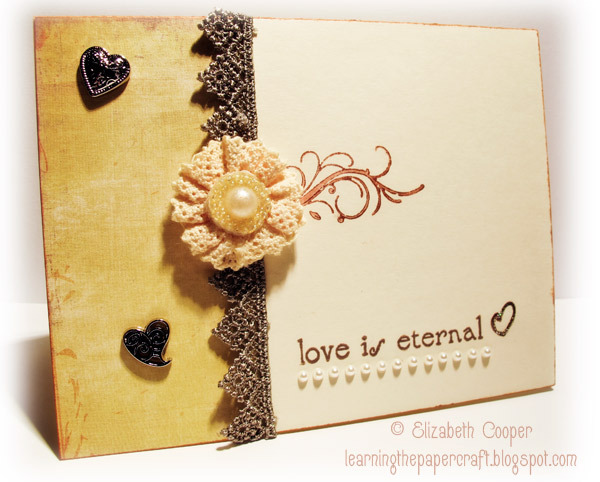 Then I chose a sentiment from the Scenic Route: Loveland Valentine's Chipboard pack and placed it at the top of the card. 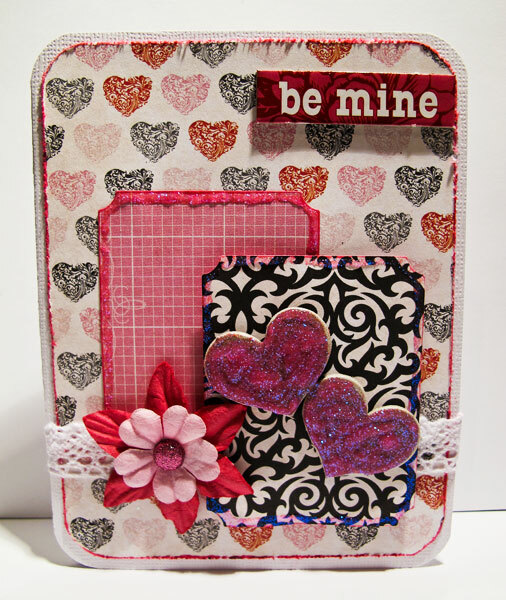 Finally, I filled in the hearts using Stickles in Glam Pink, and ran more Stickles along the edges of the pattern paper die cuts. Hi! I'm Elizabeth. I'm an artist, writer, wife, and mom to a beautiful daughter. I'm also addicted to memory keeping, planning, card making, scrapbooking, art journaling, and mixed media art.